This post is brought to you by desden.com and shabbychicboho.com. All opinions stated are 100% mine. 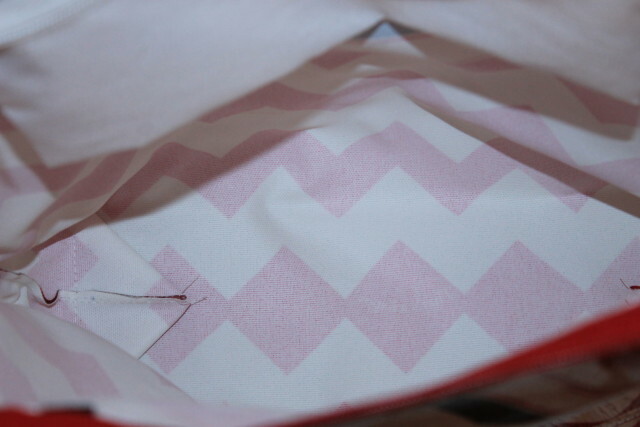 I am in love with my new Chevron Shopper Tote and you will be as well when you see mine. Guaranteed to impress even the pickiest shabby chic boho you might know. 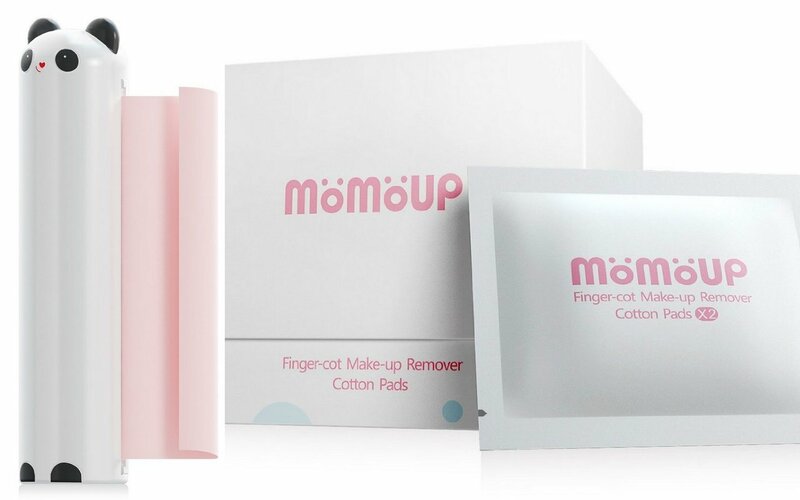 One of you will have the opportunity to win one yourself so be sure to enter my giveaway before checking out my other reviews and giveaways. 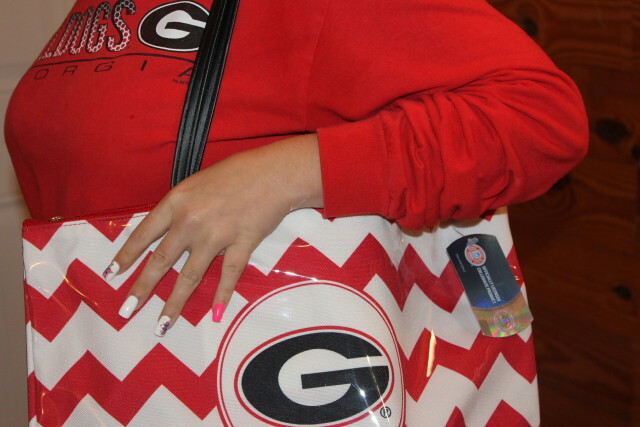 I selected the Georgia collegiate licensed tote because… I live in Georgia. 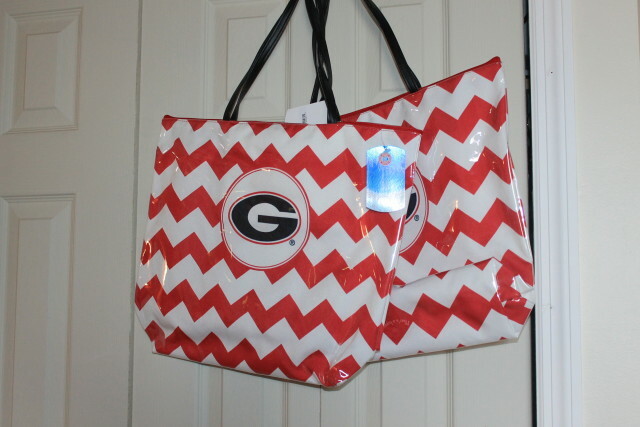 We are huge Georgia Bulldog fans and I fell in love with the Georgia tote when I was browsing around on Desden. 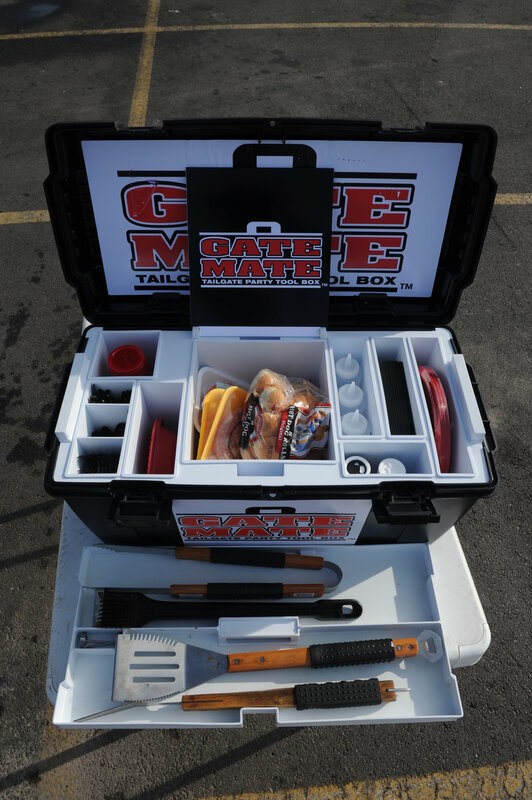 It’a nice and roomy size and perfect for shopping, traveling, going to see the Bulldogs play, or anywhere or anything else I want to take and use it for. I love the Georgia Bulldogs. 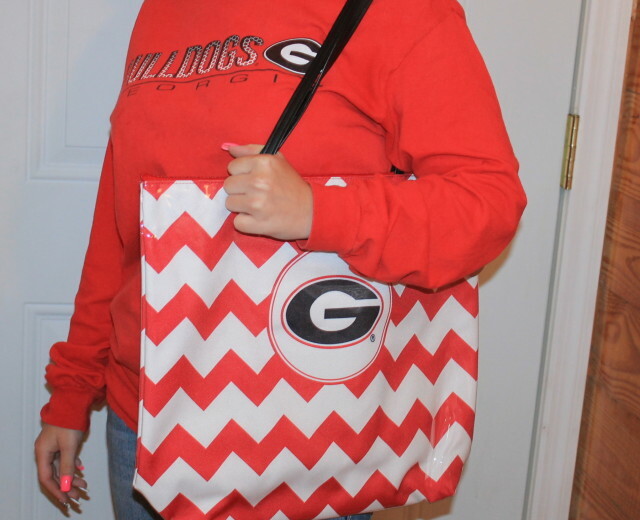 The totes look great with all of my Georgia Bulldog attire and I love that I’m supporting one of my favorite teams by parading around with my new Georgia collegiate licensed tote. Goooooooo Dawgs! 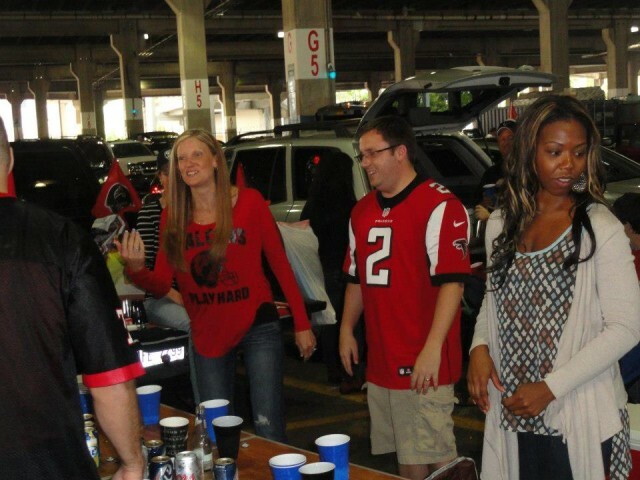 I”m a fan of the Atlanta Falcons too but that’s a whole other post. * I snitched these photos from my sons FB album. Moms can do that. 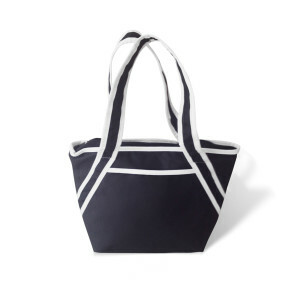 Back to my new Chevron Shopper Tote… the vinyl exterior makes it possible for me to use even if it’s raining outdoors. It always looks great because all I have to do is wash it off if it gets dirty. A little soap and water does the trick every time. I’m going to be showing off my tote everywhere I go, sharing my Georgia team spirit. 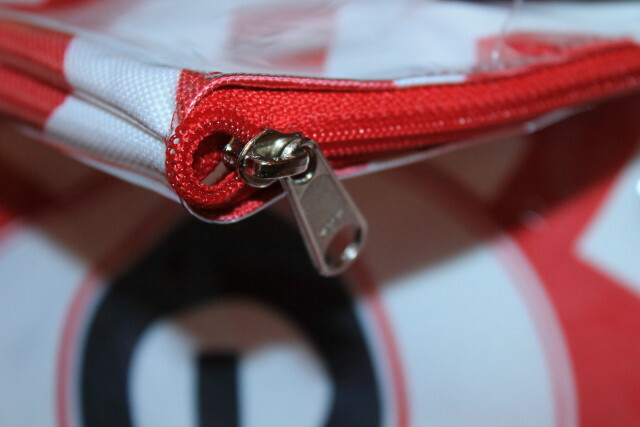 Everything is secured safely inside with a zipper that runs all the way across the top. 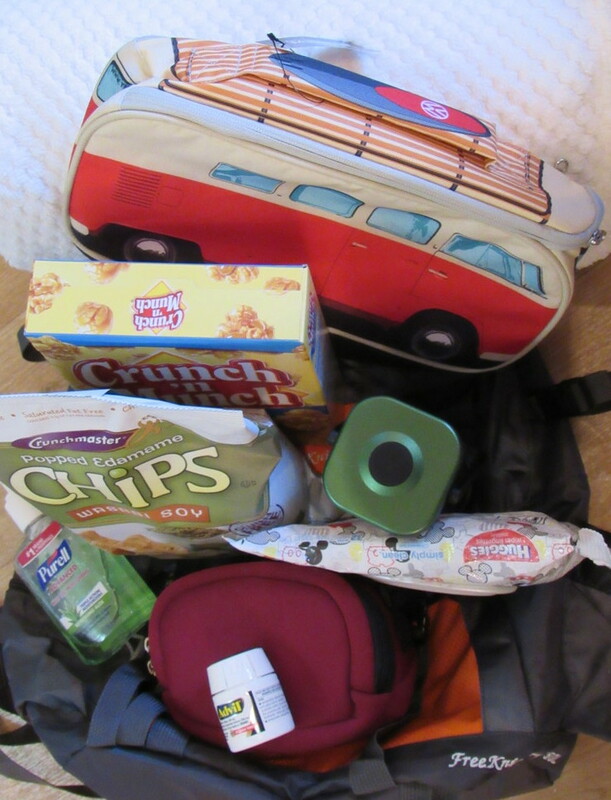 You can also keep all of your personal items secure with the zippered compartment inside. If you would like to skip the giveaway and go ahead and make a purchase, visit Desden where you will find over 40 different colleges or as a custom item with your high school or organization logo. This particular tote runs $32. Other styles available. If you live in the US and are 18+, be sure to enter my giveaway for a chance to win 1 shopper tote from Dresden. This post is brought to you by desden.com and shabbychicboho.com. All opinions stated are 100% mine. Shabby Chic Boho is not responsible for prize nor shipment of prize. I would chose the West Virginia Mountaineers Shoppers Tote for my sister. She is a alumni of that school. I would get the Nebraska tote for a friend. I’d like the Kentucky Wildcats tote for my cousin-in-laws wife because she is a huge fan and would really rock this tote. I would like to win Shopper Tote- Florida State for myself. I would love to win the Ole Miss Shopper Tote for my youngest daughter that has received a fully paid scholarship to attend as a freshman this fall!!! I forgot to say but this would be for my mother. I would choose the Louisville chevron tote. Cool color. Check! Zipper. Check! 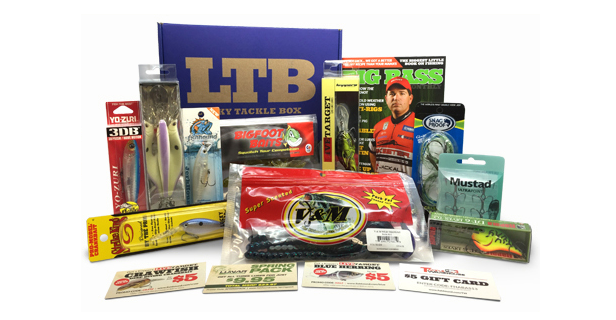 Awesome giveaway. Check! I wanna win that tote bag! That is a neat bag. Real handy. I would love to have the Greek Key Georgia all of them are so cool! nice bag. Would come in handy. The problem is Georgia or Georgia Southern. Have children that have graduated from one and another child who just is a big fan of Georgia. Only one child is a fan of Georgia Tech. Interesting here sometimes. What a great tote and seems like its the perfect size! I don’t follow college teams but my Aunt is a Longhorns fan and I think this would be a unique gift that she would love! That is so cute! We’re Georgia Bulldogs fans around here too! My sister-in-law would love this! Amy @ Marvelous Mommy recently posted…ColorFoam5k Atlanta 2015 | Win TWO Free Tickets! What a great bag! It looks like the perfect size for the beach! Yep, that’s definitely a great way to celebrate. It’s a nice looking, roomy looking too! bag. Very cute! One can never have too many tote bags. The material is great for a tote! Personalized bags make a great gift too! How fun! It looks like you had a great time. I’d love to win one for my daughter. She’s thinking on going to Iowa and this would be perfect for her! Such a cute tote. I would buy the Kansas State one. I like this. I wonder if they would have one for our team..I could totally use one like this :). 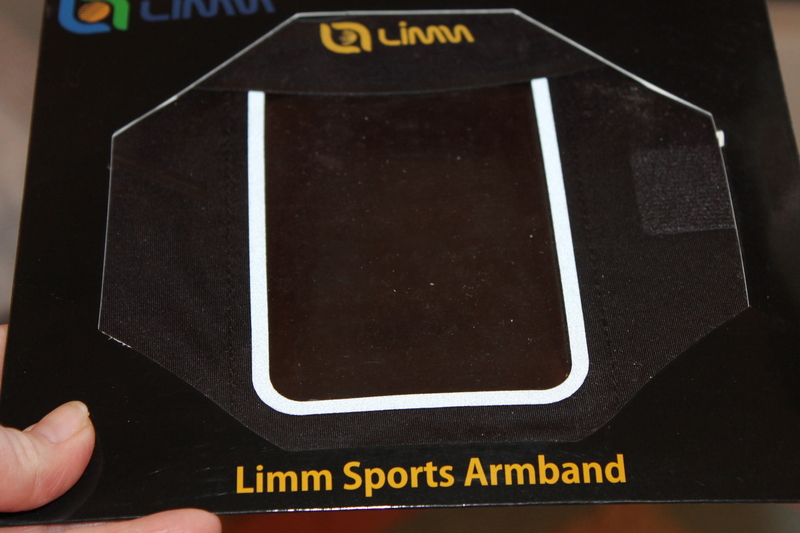 I like the smaller zippered compartment inside, and it does look pretty roomy. Oh I know someone that would LOVE this tote she is a HUGE Falcons fan. 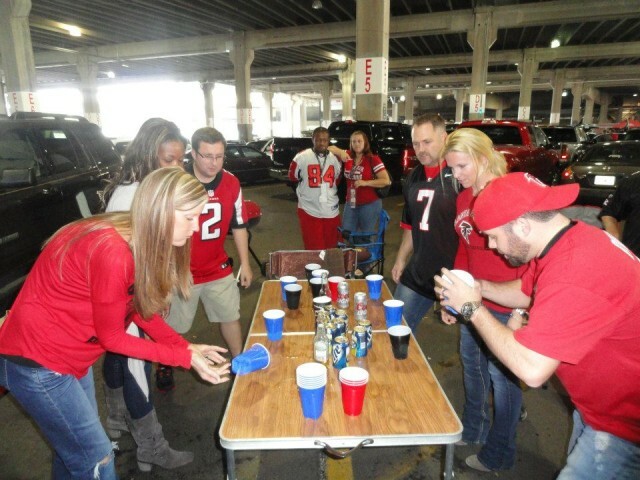 You can have a football game without the tailgating! Love it! They have the Auburn Tigers on sale for $8 this weekend. Check it out. I would pick the Texas A&M Chevron Shopper Tote! I love all the chevron bags. The Clemson one would be great. I’d love the Kansas State Wildcats Tote, and I’d keep it for myself! These totes look super cute and roomy – perfect for groceries! 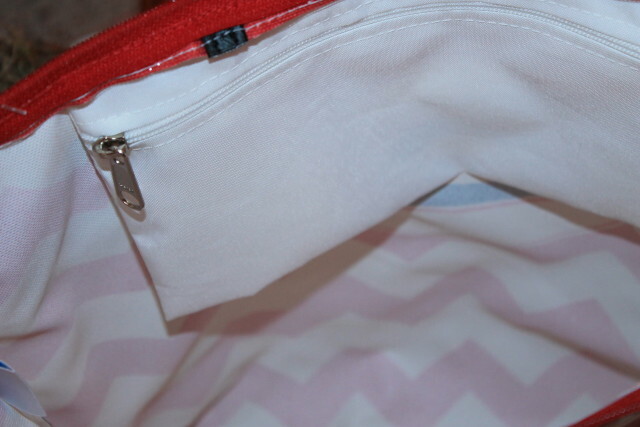 I love the chevron pattern and that the logo can be customized!